However, if you’re a couch potato or you engage in a sedentary type job you could be losing a lot of muscle and that could be a problem. In fact, you could be losing as much as 3% to 5% of muscle every decade. That may not sound like a lot but if it continues throughout your life you’re looking at possibly losing 25% or more muscle by the time you’re 70. You simply can’t lose that much muscle without suffering serious health issues. Significant muscle loss associated with aging is known as sarcopenia. If left untreated sarcopenia can lead to a decrease in quality of life, and an increase in morbidity, frailty, and mortality in the elderly. Fortunately, sarcopenia can be stopped and muscle can be improved at any age. Even if you’re in your eighties. At 57 years old I realized I was developing sarcopenia and I stopped it. I’m now stronger than I’ve been in 30 years. In this post, I’ll show you how I did it. Technically sarcopenia is not a disease. But it does share many of the same characteristics as lifestyle diseases. Recently I heard a doctor make this statement about obesity. “People”, he said, “don’t become obese overnight. It’s a gradual process. If a person gains 2 – 3 pounds a year that in itself is not a big deal. Many lifestyle diseases are like that. They seem to begin unnoticed. Yes, you realize your midsection is getting a little bigger or you don’t have the energy you once had so you promise yourself to eat healthier food and exercise more. The years and decades go by and you fail to make the necessary lifestyle changes. The disease though is gradually creeping up on you. It’s relentless. Then one day your doctor drops a bomb on you and informs you that have diabetes or atherosclerosis or fatty liver disease or metabolic syndrome. That disease didn’t happen over night. It took years to develop. Sarcopenia is like that. You don’t recognize the symptoms when it’s happening. Why Does Sarcopenia Go Unnoticed? Most of the usual strenuous tasks of everyday living like getting out of a chair or walking up stairs only require you to use 30% of your maximum strength. So if you lose 10% of your muscle mass for a couple of decades you won’t notice a big change in the performance of your daily activities. However, after your fifth decade of life, your muscle mass and strength can decrease a lot more rapidly. Some Researchers believe that, after about age 50, muscle mass may actually decrease at an annual rate of 1–2%. The decline in muscle strength is even worse. It can amount to 1.5% per year between ages 50 and 60 and 3% per year thereafter. The dangers of these changes are obvious. Obviously, the more muscle you lose the weaker you will get. Weakness, especially in leg muscles greatly increases the possibility of falls. Among adults over 65, falls are the number one cause of fatal and nonfatal injuries. Recently I attended a Beatles tribute band concert. Most of the audience were seniors. Considering the quality of the music I was shocked at the lack of young people there. But what shocked me more was the number of seniors who had trouble navigating the stairways. Several even fell as they were struggling to get to their seats. The loss of leg strength and balance in this once vibrant Woodstock generation reminded me of the dangers we all could face if we don’t do anything about age related muscle loss. While you can’t stop the process of muscle loss entirely you can vastly improve the quality of muscle you do have no matter what age you are. Providing, of course, you don’t have a debilitating illness. I know this is true because I’ve done it. I caught my muscle loss early and reversed it. For the previous 27 of my then 57 years, I had lived a sedentary lifestyle. This was not entirely by choice. I had suffered from severe chronic fatigue syndrome for over 25 years. This limited the possibility of me doing any kind of strenuous exercise. I did walk daily but walking does little to improve muscle mass. Also, I was recovering from bursitis in both my shoulders. It took two years before they healed to full functionality. Whoa!! My Arms Have Shrunk!! One evening as I happened to glance down at my arms I was shocked at what I saw. They didn’t appear to be my arms. Rather they looked like old man’s arms. They were skinny and weak looking. I got frightened. Thoughts of myself as a frail old man raced through my head. Obviously, years of physical inactivity had caused significant muscle atrophy. I knew if I continued on this course I’d be in big trouble. Since I’m not one to sit idly by and let things happen I determined to take action. After doing some reading on muscle loss I learned about sarcopenia. I found out that the primary way to improve sarcopenia is by strength training. That basically means some kind of weight lifting. At first, I thought at my age I was too old to lift weights. The more I read about strength training the more I found out it was something I had to do. Strength training has been proven to slow down the loss of muscle mass and even increase muscle mass in the elderly. However, it also has a host of other positive health benefits. Improves physical performance, movement control, walking speed, functional independence, and self-esteem. Increases bone density and improves balance. Reduces triglyceride levels and produces small to moderate reductions in resting and exercise blood pressure. Improves or reverses some of the adverse effects of fibromyalgia and rheumatoid arthritis. Helps in preventing some cancers. Helps to improve cognitive abilities. My primary strength training goals were too slow down muscle loss and get stronger. But if it could also make me healthier in other ways that would be a tremendous bonus. Even though I was about 80 – 90 % healed from CFS, I had to be extremely cautious on how I strength trained. Extra physical stress on the body can worsen conditions associated with CFS very quickly. That meant that I had to be very selective in the type of training I chose. Any kind of high-intensity interval training (HIIT) was out of the question. There’s no way I’d be able to adequately recover from that. My shoulders were also a concern. Since I didn’t want to risk re-injury, I had to be particularly careful with them. Also, I was now 57 years old. People over 50 simply don’t recover as fast as younger people. I had to find a program that would allow me to recover properly. With these conditions in mind, I decided to start with some basic exercises using light weight dumbbells. I trained 3 days a week. After 4 months, this is what my routine looked like. 4 x 12 means 12 repetitions for 4 sets. A repetition is the number of times you perform a specific exercise, and a set is the number of cycles of reps that you complete. Caution: I’m not recommending this routine. I was simply trying to find out what I could do because of my specific situation. Nevertheless, after 4 months, I had no pain. Seldom did I get overly fatigued, and I recovered well. At this point, I wanted to get serious about training. Because of my past physical problems I had some specific things I was looking for in a strength training program. The program that met all these requirements was Starting Strength. One of the main reasons why I chose this program was that it can be started at any age. It doesn’t matter if you’ve previously trained or not. It can be used by teenagers, seniors, males, females, athletes or the untrained. Anyone wanting to get stronger can use Starting Strength. Watch this video of a 72-year-old untrained gentleman. I began Starting Strength with their novice program. This is where people who have little or no prior strength training begin. As I mentioned this program can be used for any age group. However, there are modifications for those over 50 years old. Since I am over 50, I will describe the novice program for that age group. If you are younger than 50, you should check out Starting Strength Basic Barbell Training. As I mentioned the main lifts are the back squat, bench press, overhead press, and deadlift. These lifts were chosen because they involve multiple major muscles groups that mimic simple normal human movement patterns. In the workout, these movements are stressed by the weighted barbell. Eventually, the body adapts to this stress and overall body strength is developed. Once the over 50-year-old novice has gained strength and mobility with the main lifts, some accessory exercises can be added in if desired. Whenever exercising with weights, it is important to perform the lift correctly. This is key to preventing injuries and maximizing gains. I started with the minimum weight possible to learn proper form. That means using an empty barbell for 3 of the exercises. Deadlifts need a loaded bar to get the bar to the proper height. To see what these exercises entail and how to perform them, see here. Training for an under 50-year-old novice is usually performed on a 3 day a week schedule. However, for us over 50, the schedule can be reduced to two days a week. Remember we don’t recover as fast as the younger generation. Two lifting days still allows for enough rest between sessions and also good gains. 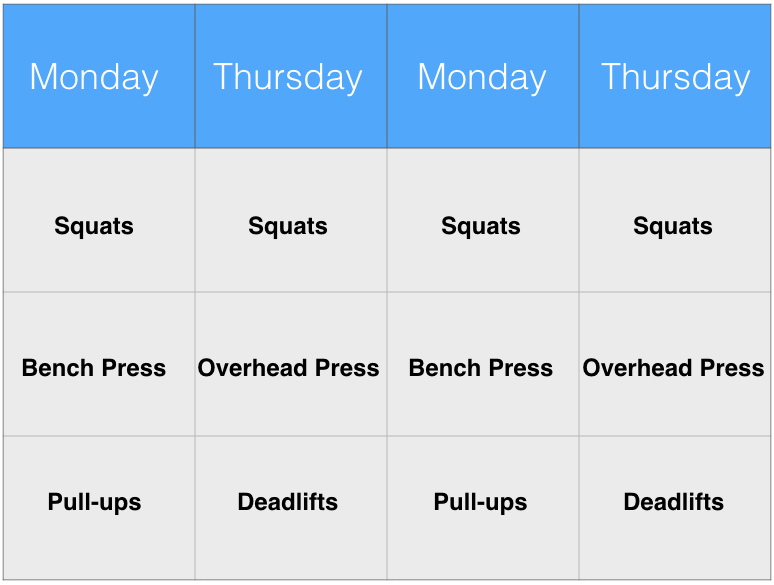 Notice that the exercises, except squats, alternate by day. Also, pull-ups are a good accessory exercise to add into the routine. The lifts are performed for 3 sets of 5 reps each. This means that the weight will be lifted for 5 times with proper form. Rest between sets can be anywhere from a few minutes to 8 minutes depending on where you’re at in the program. There are lighter bars made specifically for women. My wife Barbara started with dumbbells and easily worked up to an empty bar. Deadlifts can be started with an Olympic bar and 10# bumper plates. A beginning novice will find that they can add 5 -15# (depending on the exercise) per session when first starting out. What will happen though is that as the novice progresses, that weight will decrease, sometimes to only 1 pound or less, per session. Adding weight to the bar is extremely important. This gives you the ability to accurately gauge your performance. Also adding weight to the bar at every session indicates that you are making real progress. Personal records can be set each week for a long time on the novice program. Good progress can be made sometimes for up to a year or more before a program change is necessary. Novices generally find that they can get stronger very quickly. Without rest, you can’t recover. And without recovery, it’s difficult to get stronger. When I started the program I was 100% gluten free and on a paleo type diet. I try to keep my protein intake to about 75 grams a day. Some seniors may have to increase protein intake. See here. A great app for keeping track of your nutrition is My Fitness Pal. To perform the above exercises, you’re going to need some equipment. You can become a member of a gym that has free weights or you can set up your own home gym like I did. The following is what you’ll need. A garage, basement, or a room with a sturdy floor is an absolute must. In order to accommodate the overhead press and pull-ups, a ceiling over 8′ high is also necessary. My ceiling is less than 8′. I’ll tell you later how I dealt with it. Next, you will need weights and a bar. I use a Rogue 2.0 Olympic bar (7′), a set of weights (including 2.5# weights) and a Rogue 70″ Monster Squat Stand and bench. The rack has safety bars that can be used to prevent the weights from dropping on you if you do not have a spotter. I also purchased dumbbells I would need. If I had more height in my basement, I would have purchased a power rack. The total cost for my equipment was about $1400. Before you buy new weights check around many times people are selling used weights. Definitely buy a new bar though. You don’t want one that is slightly bent or has damaged collars. Once I switched to Starting Strength I started with 50# on the barbell and began to add 5# per week. I eventually added 2.5# per week. I started with 65# and added 5# per week. I progressed very quickly. My problem with the OHP is that my basement ceiling is too low to allow a bar to be lifted overhead. So I’m relegated to doing seated dumbbell OHP. The problem here is that when you get stronger the dumbbells get heavier and it becomes difficult to lift them into position. Seated presses with a bar puts way too much stress on your back. Don’t do them. Shoulder bursitis left me with a limited range of motion in my shoulders. This prevented me from rotating my arms fully so as to allow my hands to grip the bar while it was on my back. A leveraged squat machine served as my squat workout for a year. I have since been able to do barbell back squats. Because of my low ceiling, I cannot do pull ups. To compensate, I do bent-over dumbbell rows. See here. I kept making progress on the novice program for about two years. Once you no longer make progress then you have to change your programming. Praise the Lord in that time I haven’t suffered any major injuries. In the last year, I’ve switched to Jim Wendler’s program. At this point, Wendler’s program seems to be a good fit for me. In the first two years of lifting, I didn’t experience a lot of soreness or fatigue. Now that the weights are getting heavier I am experiencing some day after muscular soreness. I guess deadlifting 280# at 60 years old will do that to you. These are my current numbers.